Posted on December 29, 2016 by Katharine L.
Ten strangers, with seemingly little in common, are lured to an island mansion off the coast of Devon by the mysterious U.N.Owen. A coincidence? Not at all. Ten people, who have never met before until this accident, are under a perilous set of conditions. On the first night, the ten strangers are invited to dinner. They are Lawrence Wargrave, the judge; Vera Claythorne, the schoolmistress; Philip Lombard, the expeditioner; Emily Brent, the housewife; Anthony Marston, a wealthy man with a fabulous car; Edward George Armstrong, the doctor; William Henry Blore, a retired detective; Thomas Rogers, the butler; Ethel Rogers, wife of Rogers; and John Gordon MacArthur, an old general in World War I. After enjoying their delicious dinner, they are shocked when a loud voice booms throughout the dining room, accusing each of them in turn of hiding a guilty secret. By the end of the night, Anthony Marston is dead, due to choking on his drink, a deadly touch of cyanide in his glass. Badly shaken, the nine remaining people turn in for the night. In each of their bedrooms, there is a nursery rhyme going by “The Ten Little Indian Boys.” Again, is this a coincidence? However…one by one they begin to fall dead. But pretty soon, suspects are eliminated, as Mr. Rogers, Emily Brent, and Justice Wargrave were found dead next. Only Vera Claythorne, Philip Lombard, Edward George Armstrong, and William Henry Blore are left on the island. Which among them is the murderer? Dr. Armstrong is quickly out of the picture, as he is found choked and bloated next to the crashing waves. Now there are only three survivors, but is cut down to two the next day: Vera Claythorne and Philip Lombard. Blore was crushed by a large marble bear, which had fallen on his head. Soon after, Philip and Vera get into a fight on the beach, in which Vera grabs Philip’s gun and shoots him. Overcome with guilt, Vera is all alone on the island. Finally, the guilt washes over her, and she hangs herself in the large mansion. Everyone was dead. But that’s not all, actually! Agatha Christie gave me the pleasure to actually read the epilogue, which fully explained the murder and who the murderer was, who was actually (highlight to reveal spoiler)the judge, Wargrave! It told me that Wargrave was psychotic, and had a imaginative imagination and had always wanted to plan a murder. He faked his own death in the beginning, but then after Vera hanged herself, he shot himself. The whole point of this was to make this a murder case that no one could ever solve. And so he did. And then there were none. And Then There Were None is available for checkout from the Mission Viejo Library. It is also available to download from Overdrive. 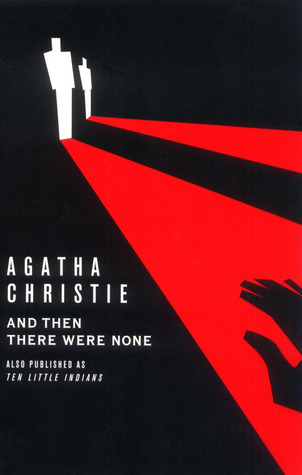 Posted on August 26, 2015 by Ahmed H.
And Then There Were None is a mystery novel written by acclaimed author Agatha Christie. It is widely considered the greatest mystery novel of all time and was published in 1939. The setting takes place on Soldier Island, a mysterious place off the coast of Devon. Ten people are invited to the island, which has only one building, a mansion, and they soon realize that one of them is the killer. I know what you’re thinking, that this kind of story has been done a million times before and is nothing special, but this is the original. Christie was the first to come up with this concept, and all others were inspired by her work. The characters are all very different and are easy to distinguish, so you won’t be forgetting who’s who. I noticed how complex and flawed each character is, which is a really good thing for a mystery because anybody can be the killer. They’re all crazy in their own ways, yet are all sane. For a while, Christie uses the method of jumping back and forth between characters’ perspectives, and at first this seemed like an issue, especially since we could hear their thoughts. It’s not. We get an understanding of each character’s psyche, yet we don’t really get any hints as to who’s the killer. Each character is suspicious at some point in the story, some more than others, but you can never be too sure. A small twist at the beginning heightens the tension even more. The pacing is phenomenal as well. It starts out slow and calm as each character is being introduced, and as secrets begin to unravel and characters begin to die off, the tension rises. The suspense makes this a real page-turner, and by the second half your eyes will be glued to the pages trying to figure out who it is. And as hard as you try to find out, once it is revealed you’ll be in a state of absolute shock. All in all, And Then There Were None is the epitome of what a great mystery should be. It’s got compelling and suspicious characters, a fantastic atmosphere, and is very suspenseful. Anybody who is looking for a tense, suspenseful mystery should look no further than And Then There Were None. And Then There Were None is available to check out from the Mission Viejo Public Library and Overdrive. Posted on November 24, 2014 by Anmol K.
If you were to receive a vague letter that enticed you to an island for a pretext, would you still go? 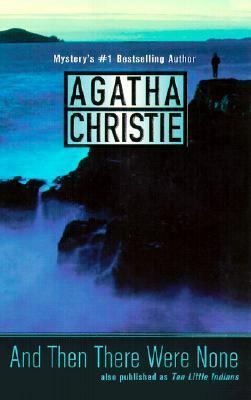 Such is the situation in the thrilling page-turner, And Then There Were None by Agatha Christie, ten people from different walks of life each receive a letter for a different purpose to go to Indian Island. But all of them have one thing in common: they all are indirectly involved with a person’s death. In their rooms, at the mansion, each person has a framed copy of the poem: “Ten Little Soldiers.” After having dinner the first night, they all are in the living room when a gramophone announces each person’s name and whom they indirectly murdered. On the same night, Anthony Marston takes a sip from his drink and starts choking, an eventually dies. One by one each guest is murdered, and the guests who are still alive realize that the murderer is amongst them. I thought this book was awesome. It was a real page-turner and I did not want to put it down. If you are looking for a great mystery-murder novel, then this book is recommended for you. As you read the book, you try to figure out who is the murderer. After you suspect one person, they turn out to be the next victim. This aspect of the book was fascinating to me. I won’t give much of the ending away, but the way the person executed their actions was improbable. Advised for anybody who loves suspense, read And Then There Were None.